One of the most powerful antiwar statements of the 20th century remains Pablo Picasso’s stunning 1937 oil on canvas, “Guernica.” The painting conveys from its large canvas the atrocities, pain and suffering of war in graphic details of newspaper photojournalism, shifted through the surrealist lens of Picasso’s cubism. “Eleven Reflections on September,” three-dimensionalizes the message of Picasso’s Guernica, using poetry, spoken word, original music, video and world fusion dance to bring this message that war garners no true victories into the 21st century. “Eleven Reflections” – part of the citywide Women’s Voices Theater Festival taking place this fall in Washington, D.C. and its surrounding suburbs – draws on the Arab-American experience both pre- and post-September 11. The result is a searing artistic statement of the troubling pain and displacement that occurs when the known world is over taken by the unknown, the uncertainties, the indignities and inequities that happen in war and uprising. Beginning with a haunting violin and low call of the didgeridoo, flames flickering on the backdrop, poet and spoken world artist Andrea Assaf’s words tumble out. She begins at that brilliant and horrible moment in 2001 when the world changed. The planes and towers were down. Chaos reigned in lower Manhattan and Assaf speaks presciently: “everything that came before was over.” Now there’s a line, a division, a before and after, a moment where Americans in particular realized their vulnerability on the world stage. She speaks of the “smoke of memory” as video captures horrific images of twisted, collapsed buildings. When black-clad dancer Donna Mejia enters, shoulders bare, skirt full and flounced, hair twisted into a topknot, the violin, played by Eylem Basaldi, shimmers, the doumbek played by Natalia Perlaza provides the syncopated beat. And Mejia’s head and shoulders roll, undulating to the beauty of the sound, replicating the wafting smoke alluded to earlier rising into the brilliant, blue sky on that once-gorgeous then horrific September day. Assaf talks of fruit trees, particularly the emblematic olive which takes generations before its pleasant yield can be harvested. Mejia’s arms reach like the branches, then reshape themselves into sharp-elbowed corners – trees cut down, towers downed, souls sacrificed in a split second of insanity and inhumanity. Choreographically Mejia helps embellish Assaf’s text just as calligraphers often embelish Arabic script into curvilinear designs with graceful arabesques linking and winding into letters, words and verses. In a melding of dance forms referred to as transnational fusion, she draws upon tradtions from the Middle East, Asia, North Africa and western modern dance. As letters and words collect on the backdrop in Pramila Vasudevan’s video, Mejia has gathered hip rols and shimmies, arm undulations and shoulder rolls, convulsive contractions of the midsection and torso and deep lunges, her supple body circling above. Assaf brings forth a basin of water infused with bunches of mint – an act of purifying, of hospitality, of offering. Mejia seems to expand to a haunting wordless chanted call let forth by Luna, then later, she plants both feet firmly into the ground, her solid wise stance an act of ownership and defiance as images of uprising populate the backdrop. The reflections, drawing from the specificity of Assaf’s experiences reified in poetry form the basis for a soul-piercing experiences. While September 11 has had life-changing effects on many aspects of our society and government, “Eleven Reflections” personalizes the act of communal remembrance and also illuminates the specificity of the Arab-American experience. Mejia’s choreographic contribution to the work allows the words to resonate more fully, underlining and highlighting moments when Assaf’s poetry spurts forward, quickly relentlessly. The dance moments, a shoulder tremor, a head roll, arms twisting, snaking, like the wrapped coils of Mejia’s hair. The elemental mix of these complex dance genres, and the richly evocative world music forms serve to broaden and deepen the viewer’s experience. “Eleven Reflections” with its richly collaborative contributions of singular women’s voices illuminates the antiwar message at the root of Assaf’s poetry. As the poet, clad in black, forges forward, leaving the stage, Mejia takes over. Suddenly her hips tremor and erupt at breakneck speed, the jingling coins of her hip belt punctuating the drum and violin. It’s not merely celebratory, but, more importantly, it’s life affirming. Picasso overwhelmed viewers with the horrors of war in his politically driven “Guernica.” Assaf’s canvas is equally large and she is not immune to the politics of this moment in time and the resonance of September 11, concomitant uprisings and crises occurring in the Middle East, and beyond. But she and her collaborators don’t wallow in the destruction. In their 21st century multimedia “Guernica,” they recount war’s horrors and the politics of hate, but then push onward, beyond. Amid the death, destruction, protests, and prejudices visited in the piece, blood still courses through veins, muscles still flex, hearts still beat, poetry still rings out. Life, even in the unrelenting grip of war and destruction, goes on and that is the true message “Eleven Reflections on September” leaves viewers to ponder. For decades now, initially as founder and artistic director of Liz Lerman Dance Exchange, now as an independent itinerant artist, choreographer and public intellectual, Liz Lerman has been pushing dance outside of its traditional boundaries. She has choreographed in train stations, at a naval shipyard, in art galleries, and in the red-carpeted grand foyer, the women’s rest room and the loading dock at the Kennedy Center in Washington, D.C. Her dancers have long upturned expectations — ranging in age from their early 20s to well into their 70s and beyond. Some have been trained in dance techniques from ballet to Graham, Cunningham, and release; others are neophytes, maybe young children or residents of a retirement home who haven’t had a minute of dance performing experience. 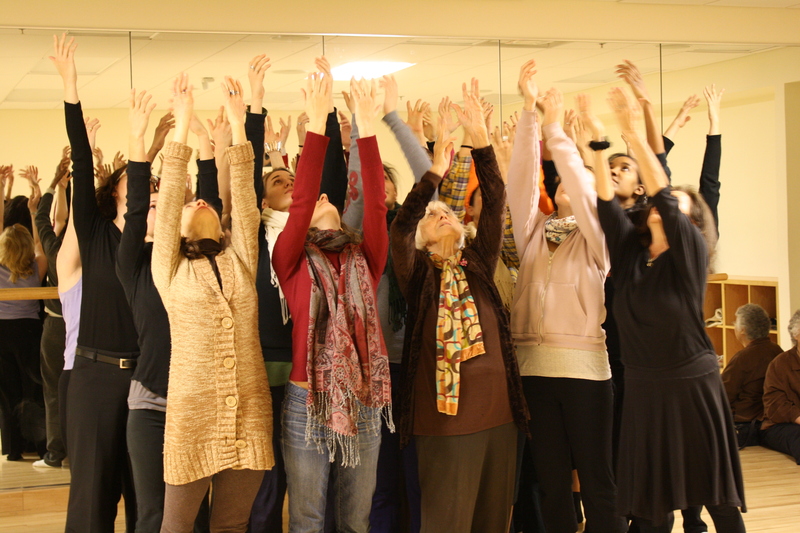 No matter, Lerman is a master of choreographing for a diversity of bodies, experiences, ages and expertise. She has a knack for making everyone look their best by allowing for gradations and careful pruning of movement material, often down to the simplest of gestures that speak volumes. This past spring, two new Lerman works brought her back to her long-time home turf in Washington, D.C., and the Maryland suburbs, three years after she walked away from the company she bore and built beginning in 1976. The Dance Exchange remains active at its Takoma Park, Maryland, home on a more localized level than under Lerman’s guidance. On her own, Lerman has found more time to experiment and to delve deeply into projects that matter for her right now. Her second collaboration with an orchestra, the University of Maryland Symphony Orchestra, proved a fruitful follow-up to the lovely, spare and unapologetically rigorous rendering in 2012 of Claude Debussy’s prelude for Afternoon of a Faun. There Lerman, along with the collaboration of conductor James Ross, pulled the chairs out from under the players and crafted movement sequences, groupings and even a few balletic steps that the instrumentalists could master while simultaneously playing the score to fine effect. Initial comments prior to experiencing this newly realized setting of an orchestral score, amounted to snide questions about violinists and cellists being equated to marching band musicians (who, by the way, are no slouches in either musical proficiency or embodied movement). This past May 2014, Lerman and Ross tackled a 20th-century American classic: Aaron Copland’s vibrant score for Appalachian Spring. Of course, much historic resonance accompanies the work. Copland’s commissioned work, scored for a chamber-sized orchestra, premiered at the Library of Congress in 1944 with Graham’s choreography. This piece of Americana, which blends national values of independence, manifest destiny and the communal spirit, could not have been more prescient coming out as the United States was entangled in World War II, with its native sons stationed across three continents from Europe to the Far East. 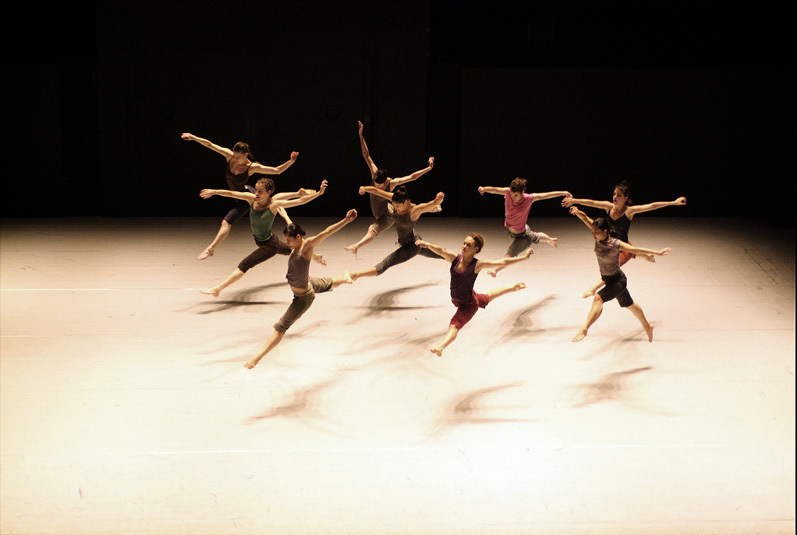 Copland titled his 30-plus minute dance score Ballet for Martha, while Graham took inspiration from Hart Crane’s poem “The Dance.” Lerman’s take on the work includes homage to the Graham original, an acknowledgement of its inherent American melodies and rhythms and, most distinctively, a deeply contemplative regard for the mystery and reward of artistic inspiration. 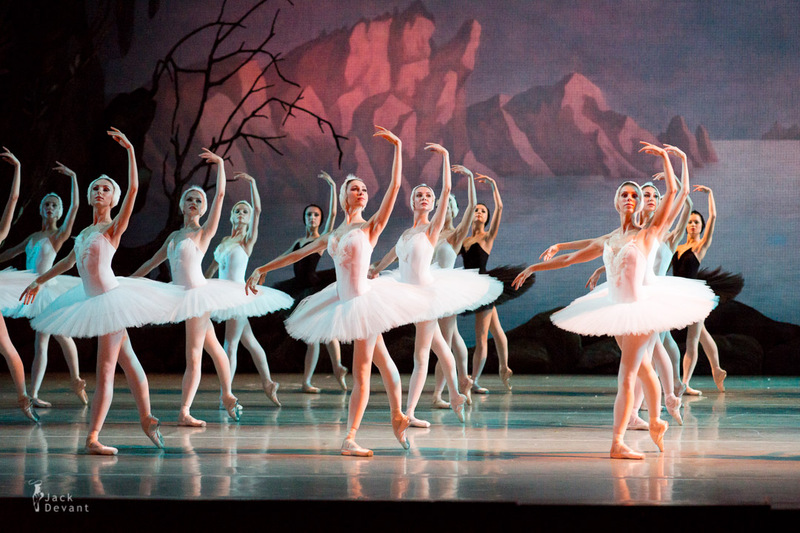 It’s as if the ballet has riffed on itself and on the juicy and productive thought processes of its original creators – composer and choreographer Copland and Graham – in seeking a higher level of inspiration and communion. In Lerman’s piece, Copland’s work opens with soft arpeggios and the musicians, freed from their chairs, enter; first a chamber-sized group walks and plays the clarinet, oboe and other instruments contributing to Copland’s thematic material. Clad in denim and khaki, shades of blue and beige, some players barefoot, others in sneakers or boots, they walk, sway, skip, dash and fall into formations. 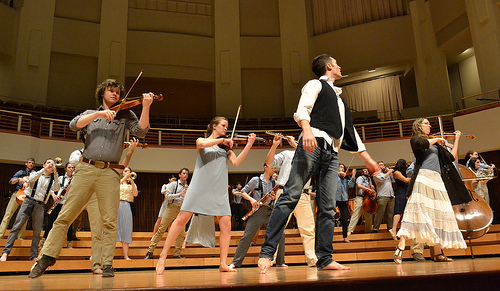 A quartet of string players lifts their bows into the center of a circle as they suggest a living carousel. The cellists have their instruments strapped to their shoulders so they can still maneuver the steps of the Gildenhorn Concert Hall stage. A bass player hoists his instrument high above his head a few times during the piece. There are nods to Copland’s Americana themes: do-si-dos and allemands without the hands, lines and circles weaving in and out like a reinterpreted square dance as the instrumentalists play and maneuver. 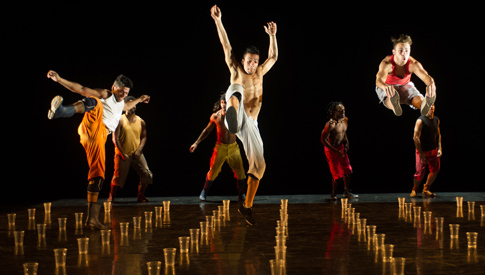 The work’s centerpiece though, both visually and morally, is long-time Lerman associate Martha Wittman, who possesses more than a half-century of dancing, teaching and performing experience. She sits initially at a small desk, channeling the creative artist in her element as she simultaneously pays an homage to both Copland and Graham, the two highly opinionated creative forces behind this quintessential American work. And Wittman with Enrico Lopez-Yanez, a graduate student in conducting, serve as the work’s drum majors or pied pipers, leading lines and circles, spirals and whirling vortexes of string players and woodwinds, brass and drums around the stage, which has been carefully and lovingly lit in evolving shades of cool blue and warm yellow to compliment the mood and tenor of the musical passages. Lerman also pays a sense of tribute to the staunch and angular canvas that Graham crafted in telling her tale of a frontier marriage and the complex psychological forces that spurred her inner turmoil. In Lerman’s hands, though, the movement loses this mid-century modernist gloss for something far more lyrical, democratic and (Lerman’s calling card for decades now) easy to read and render, by dancers and non-dancers alike. 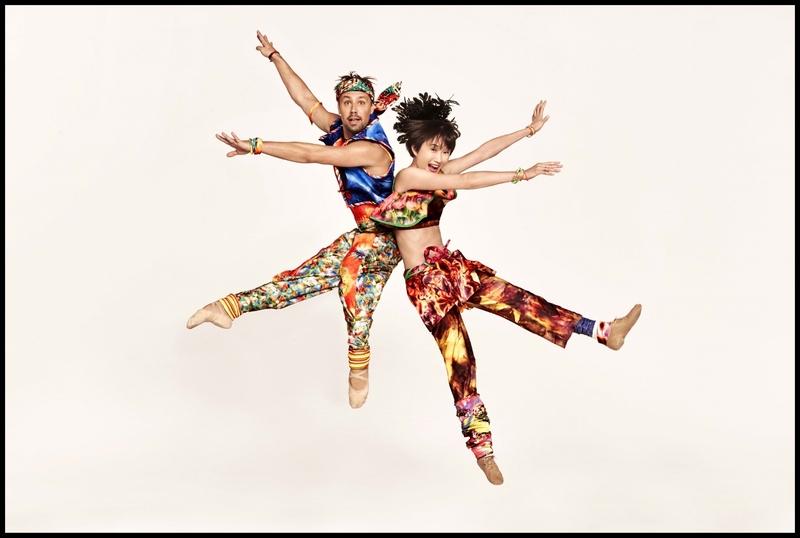 Lerman, with creative co-choreographic input from Vincent Thomas, another former dancer in her now-defunct company, has drawn upon multiple talents of these mostly graduate school-level musicians. Not only can they play, but some (a violinist at one point) can play bars while dancing a jig, a flutist can skip upstairs and not miss a beat, and a trio of men can lift up a bassoonist on another student’s back in a circus-y moment that underlines the sense of play that Lerman has drawn from these otherwise serious musicians. 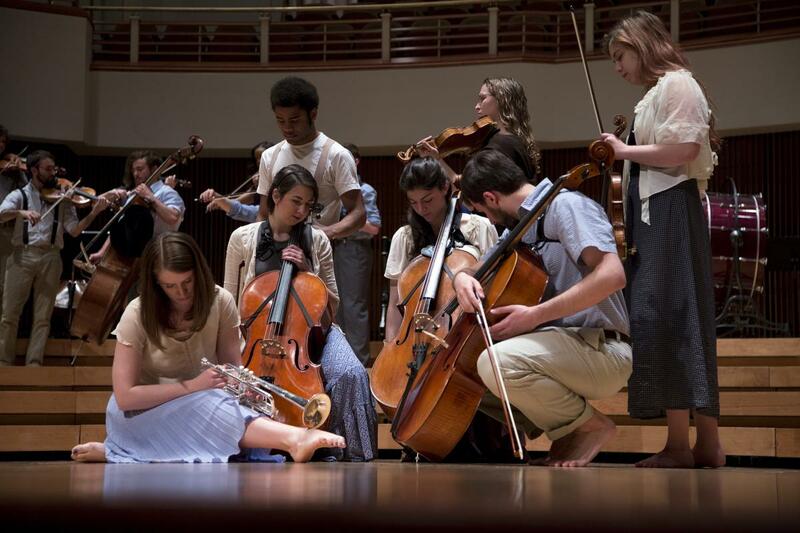 Thomas (who has a perfect background as a choreographer for college flag teams) and Lerman have been able to draw out a surprisingly rich, varied and daring palette of movements from these budding orchestra professionals. The risks they have taken to play and maneuver do not seem to have taken much toll musically on the Copland score. And if there were glitches from time to time, they were more than made up for by the liveliness and intensity of commitment these musicians had for the project. Once the piece arrives at the “Simple Gifts” theme, with its moderatos and crescendos, it’s hard not to be sold on this project. Then in a final act of spiritual offering, as the theme wanes and returns to its sparest melodic lines, the musicians step to the edge of the stage and place their instruments – flutes and French horns, clarinets and basses, violins and oboes – lovingly on the floor before stepping back and leaving the final notes to the clarinet and xylophone and final movement to Lopez-Yanez and to Wittman. Wittman recapitulates a simple hand gesture: her open palm held aloft, balancing and tossing the unseen. Wittman has held the orchestra and audience in her thrall. Within that softly executed moment is a world of creativity. It’s the magical life force of how music and dance, poetry and song, come into being. Lerman’s Appalachian Spring gifts us with the drama of the creative force itself in all its glory, mystery and spirituality. 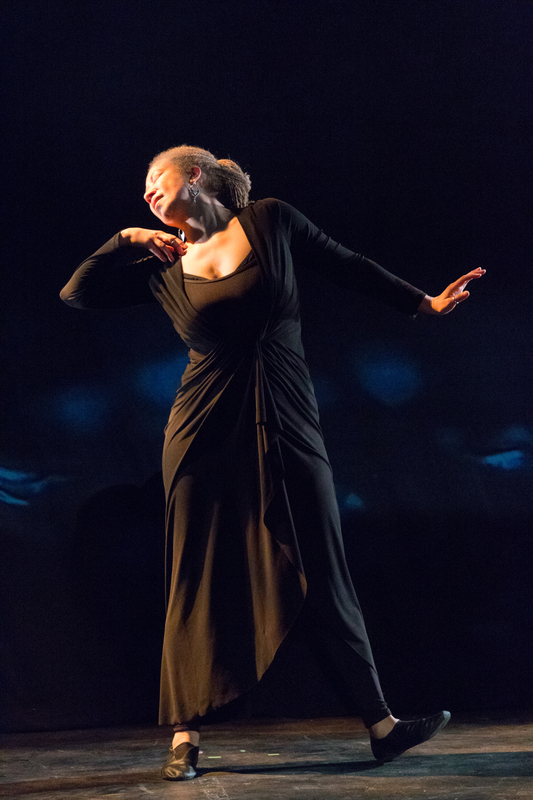 Among Lerman’s ongoing creative projects is her continuing experimentation in what she has called “non-fiction dance” or “non-fiction choreography.” Many of her works spanning her more than four decades of dancemaking have drawn deeply from her personal experiences, along with those of her dancers (whether professionally trained or not) – her chief collaborators. In complex, multifaceted evening-length works she has addressed the mapping of the human genome (Ferocious Beauty: Genome), the origins of everything (The Matter of Origins), the harrowing Nuremberg trials (Small Dances About Big Ideas) and the massive reach of Russian history (Russia: Footnotes to History), to name a few of her large-scale, intensively researched pieces. Lerman’s latest work deals – emotionally, viscerally, practically and historically – with war and its aftermath on individuals. Healing Wars, which made its world premiere in June 2014 at Arena Stage’s Mead Center for American Theatre in Washington, D.C., alternates both effectively and ineffectively between two American conflicts: the Civil War and the present-day wars in Afghanistan and Iraq. Under Lerman’s directorial influence, these events, separated by history and 150 years, are both equated and contrasted so that in an 80-minute evening, the build-up of concepts and ideas becomes overwhelming. At times it’s easier to shut down than take in one more sound-bite, revelatory confession or factoid about war, medical advancements, healing and return home. One way Lerman accomplishes this is by examining and exploring the smallest of details – the incremental overrides the universal. One doctor’s story of a surgical incident, one soldier’s experience with the ramifications of an exploded IED, one woman’s tactics to survive on the home front, knowing her partner is far from home with danger close by, are told and meant to be instructive and didactic in result. Lerman’s biggest pieces work through accretion – the additive nature of these vignettes; narratives performed in words and gestures; images, ideas, confessional passages; choreographic tidbits; and other viscera she accumulates. They often finally overwhelm, yet simultaneously they unfurl, with effective and salutary results. Dance, movement, narrative, individual experiences are universalized and by documenting them they become something greater than the one. In Lerman’s hands they become representative of the man, and universalize (in this case) our (and others’) experiences of war and its aftermaths. She does this with the able choreographic assistance of one of her long-time affiliates, dancer Keith Thompson, as well as co-artistic collaborators Heidi Eckwall creating lighting; Darron L. West, contributing sound; Kate Freer providing the multimedia and video elements; and David Israel Reynoso crafting the unobtrusive sets (including the most compelling, a chandelier-like mobile of hanging military cots) and the simple but effective costumes that draw on Civil War and modern military garb. As much devised theater as it is dance, the performance begins before the audience even enters Arena’s most-intimate space, the Cradle. Led in the back way via the stage door in groups of about 12 to 15, one walks through a museum-like collection of life-sized, living dioramas, each populated with a performer recreating a moment from the Civil War era or from today. There’s Alli Ross, perched on a high stool-like bicycle seat, a woman disguised as a Confederate soldier. She is glimpsed through a broken window, a closed room with an off-kilter bed hung from the ceiling (foreshadowing Reynoso’s set). And Tamara Hurwitz Pullman, properly clad in a hoop skirt, portrays Clara Barton, founder of the American Red Cross, as she sifts through thousands and thousands – 63,000 according to a museum-like placard nearby – of letters requesting information about missing Civil War soldiers. Ultimately, the final vignette both dramatically and morally becomes, the centerpiece in the 70-minute work. Hollywood actor Bill Pullman (Independence Day) shares a bench with Paul Hurley, a former U.S. Navy gunner’s mate and graduate of Duke Ellington School for the Arts in Washington, D.C. They chat casually about Hurley’s wartime experiences. I overheard his telling of an epic bar fight between Australian, German, Dutch and Greek soldiers. The Aussies started it, he claimed. Unspoken, at least in the snippet I heard, but later revealed, is the narrative detailing how Hurley lost his leg in Bahrain and how he faced an arduous recovery. As the audience files into their seats, Samantha Spies meanders the stage, lantern in hand, her rough-cut burlap dress indicating her slave caste – but her presence more otherworldly spirit and angel than downtrodden slave. Her guise provides an elemental and earth-centered connective thread to root African movement traditions, while suggesting to an ephemeral spirit’s presence. 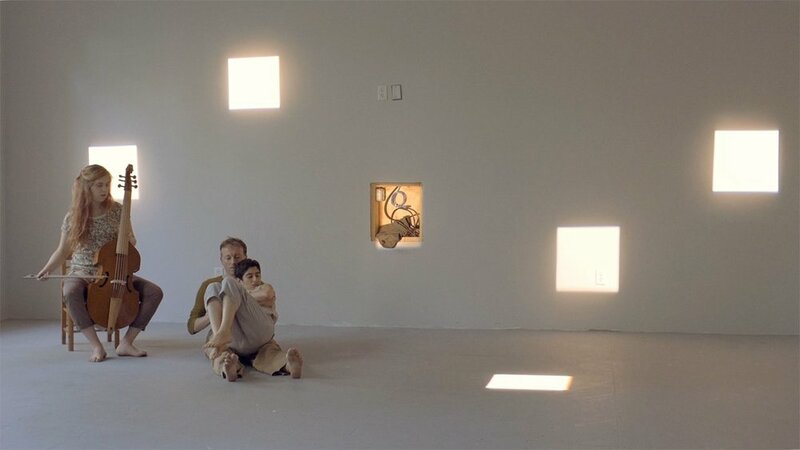 Spies helps the viewer switch between present and past, between realistic and otherworldly realms, between the Civil War and Afghanistan and Iraq, between modern-day operating room and deathbed. It’s hard to misconstrue her true role once she completes her monologue – she’s an angel leading characters to their deaths, gently or gruesomely. Actor, and here monologist extraordinaire, Pullman serves as the work’s core: he’s both guide and example, playing a military surgeon who lectures before a group of patrons back on the home front. In Hollywood films Pullman has played an American president, so his authoritative demeanor almost steamrolls some quieter, less specific moments. But the evening’s centerpiece arrives when Pullman and wounded vet Hurley converse. Hurley removes his prosthesis and performs a duet giving himself over to dancer Thompson, who has crossed over from Civil War to today as a supportive partner in the wounded man’s healing. The compelling moment – undeniably, ultimately self-sacrificing and draining — demands that attention be paid. Our wars – American wars – are fought in distant lands. Lerman’s goal with this project was to bring the present-day wars and their aftermath home, just as, in its time, our nation’s largest and most divisive war, the Civil War, touched nearly every household and life as citizens witnessed battles and the tragedy of the wounded and dead in their midst. Lerman’s work in drawing together these disparate but not dissimilar moments of history, along with the science, medical advances, politics and, of course, personal experiences, forces contemporary audiences to pause and consider that as individually painful as war traumas are, the suffering that results is our nation’s burden to bear. Lerman, here, through the compelling forces of dance theater, underscores the gravity of that burden. This review originally was published in the Spring 2015 print edition of Ballet Review (p. 20-23). To subscribe, visit Ballet Review.